Peer Coaching is a powerful process for enabling two or more people, who share common interests or goals, to collaborate in helping one another become more successful in their work or personal lives. This Infoline focuses on the many benefits the process of peer coaching can have in the corporate world. 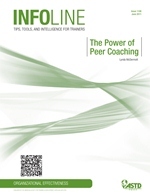 This issue of Infoline defines peer coaching, and how it differs from other forms of coaching, counseling, and mentoring. It also highlights the different types of peer coaching models, and the advantages and disadvantages to each, from working internally within an organization, to extending the peer coaching process among organizations and linking members through a larger network. The steps for setting up a peer coaching program, the competencies required to be a successful peer coach, and ways to measure the success of such a program, are also outlined in this issue. 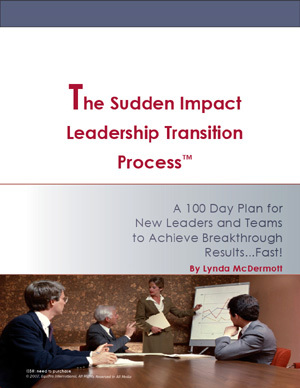 The Sudden Impact Leadership Transition Process™: A 100 Day Plan for New Leaders and Teams to Achieve Breakthrough Results...Fast! So you've got a new leadership job and a new team, now what? To succeed in today�s competitive world, you need to "hit the ground" running and show results almost from day one. This self-help Guide walks you through the steps to help you learn how to achieve breakthrough results sooner rather than later! 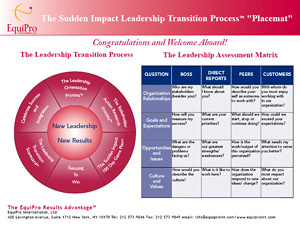 Want a convenient reference tool for helping you through your leadership transition? This 'placemat' provides a calendar of activities and tips for navigating your way through your new organization. 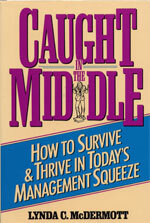 If you're a middle manager with your head on the chopping block due to downsizing - or you just feel like a puppet on a string pulled this way and that by higher-ups in your organization - this book will give you the tools to finally take control of your career. It's packed with business-tested strategies to revitalize your role in a company too large to know you exist. 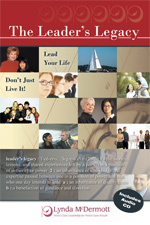 Leader's Legacy: Lead your Life ... Don't Just Live It! Research continues to show that strong emotional intelligence is critical for anyone hoping how to become a top-performer in their workplace. Emotional intelligence provides us with a better understanding of ourselves and those around us. 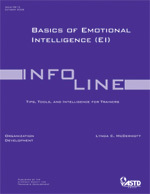 This Infoline is designed for anyone looking to understand the basics of emotional intelligence with an eye toward improving their abilities. Readers will learn how emotional intelligence is related to work performance, how to assess their own emotional intelligence, and how to develop their emotional intelligence competencies. You will also learn some tips on how to develop emotionally intelligent teams. 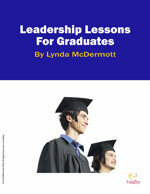 This booklet was adapted from a speech delivered to the graduating seniors of Miami University. It encourages young adults to recognize that they have the power to create their own leadership legacies...beginning today. "Lynda has helped our alliance navigate through turbulence to a point of smooth sailing. 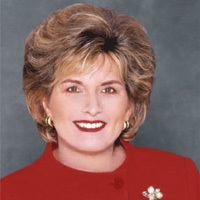 She can be trusted to provide practical advice and tools to help both alliance companies achieve their goals."